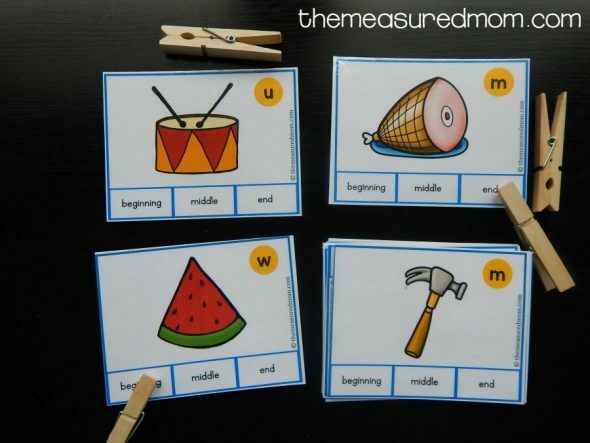 Today’s freebie is a wonderful way to help kids hear beginning, middle, and ending sounds. 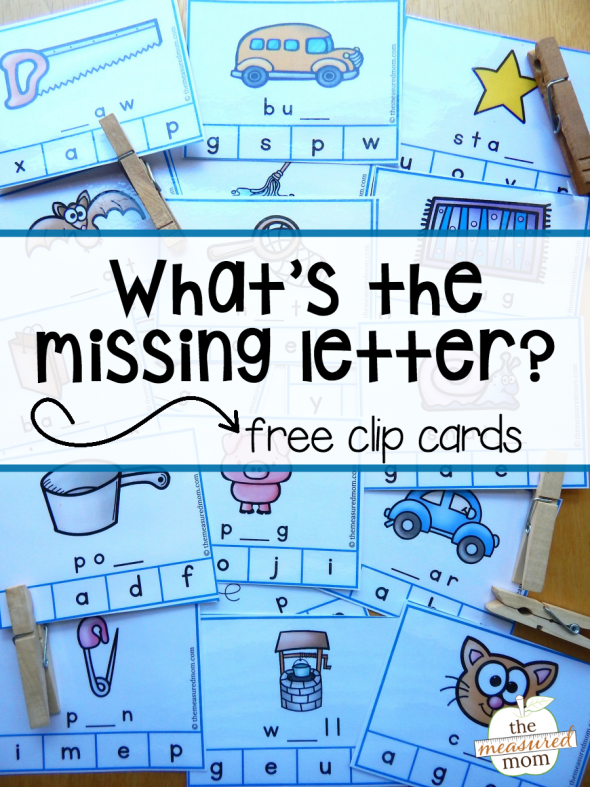 Try this missing letter activity! 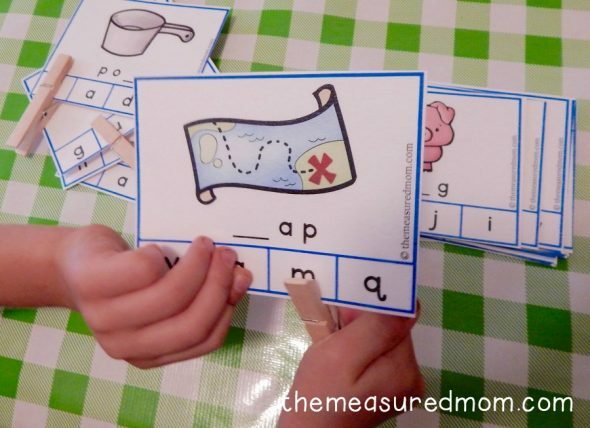 Now that my son knows all his letter sounds (thanks to our letter of the week activities), we’re moving on to hearing those sounds in different parts of words. A few weeks ago, we did this activity. He looked at the letter on the top of each card, said the picture’s name, and figured out whether that sound was at the beginning, middle, or end of the word. Now I have a new set of clip cards to take that knowledge a bit further. This time, my son looked at the location of the missing letter and chose the correct letter from the choices on the bottom of the card. 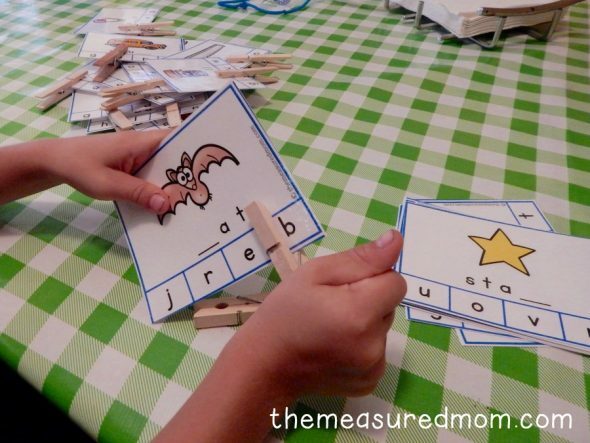 You could use these cards as activity for early spellers, but that wasn’t my intent. My son isn’t spelling yet, beyond his name and a few words like the, cat, Mom and Dad. Instead, we focused on stretching the words out and really listening for the missing sound. I was pleasantly surprised at how well he did with these, but those short vowels give him trouble. 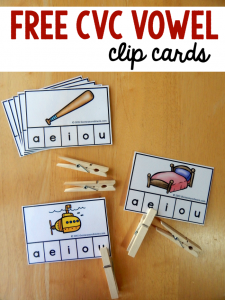 I’ll have to pull out our “Clip the short vowel” cards. Will you give these cards a try? 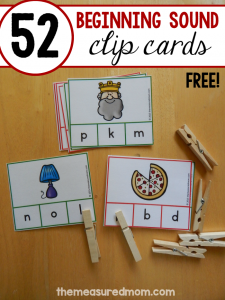 Don’t miss the rest of our clip cards for pre-readers! 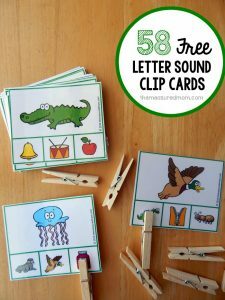 I downloaded and printed the Beginning Sounds clip cards and my 5 year old and 3 year old are loving them. Thank you for all these great resources! I was wondering what kind of color printer you have and if you like it? We only have a black and white one, so I have to take color items to Staples to print and it is VERY expensive. I realize I could print in black and white, but some things are just nicer in color. I have a big, heavy duty color printer for my blog work. It’s a LaserJet Pro 400 color. It’s more than most people would need. We use refurbished ink cartridges to save money (my husband buys those online). Before this printer I had a Canon Pixma. Overall I was happy with it. I always recommend buying off-brand ink to save money. I *LOVE* these! They are absolutely perfect for my preschooler. She’s being using your rhyming cards and beginning sound cards and is just about ready for something a little more challenging. Thank you so much! 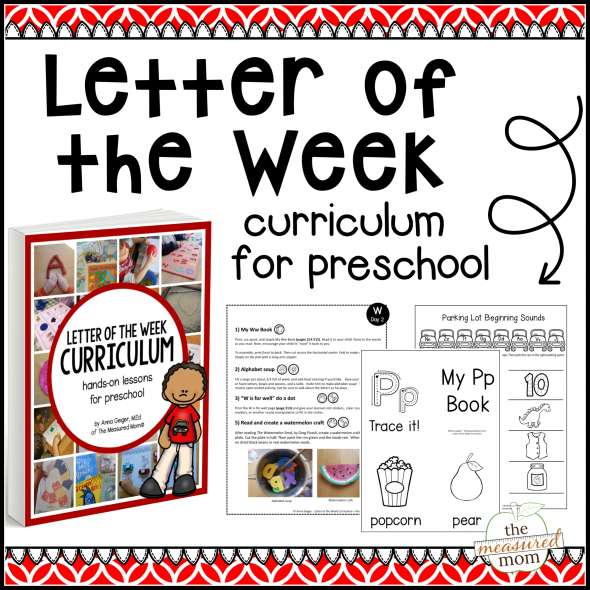 Thank you Anna, we love your printables! Here in Italy I use them with both my children but also with the “preschoolers” in our democratic school. They love them! That’s so wonderful to hear, Ivonne – thank you so much for your comment! How wonderful that you are sharing these. I spent hours making cards like these when I was teaching covering them with contact paper before the days of lamination. So much better than worksheets. I always check out your site to see if there is anything I can use with my tutoring students. I have told many friends and teachers about your site. So . . . two thumbs up! Oh, those contact paper days… I don’t miss them! When I was teaching lamination was all the rage, but we didn’t have too many teaching blogs yet. I’m glad you’re still tutoring so you can benefit from all the resources and freebies we can get nowadays! 🙂 Thanks so much for passing on my site! Hi Anna, I’m very thankful found this website !!!! 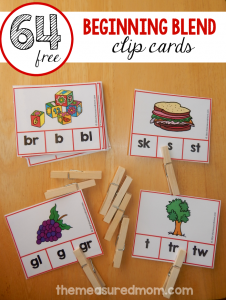 I love all of your clip cards! 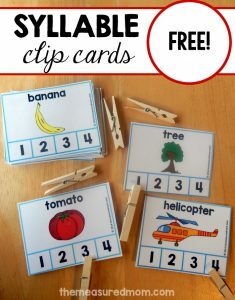 They are perfect for my elementary Special Ed kids. I hope it’s ok that I changed up the way we use some a little. I cut off the letters at the bottom, and glued them individually to clothes pins. I clip the pins along the left side of the card. 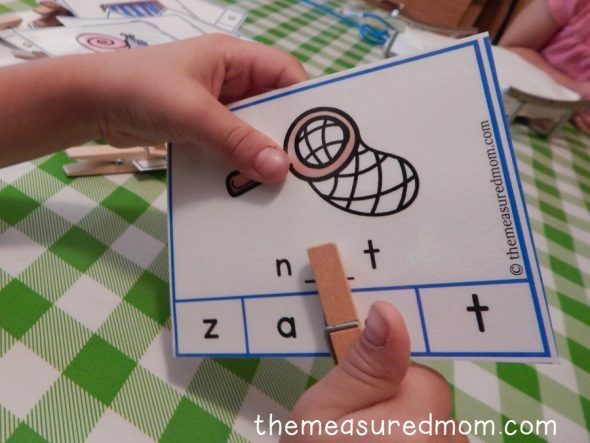 The kids choose the correct letter to clip under the picture. It’s the same skill, just a little different approach to keep it interesting. We also use the red/yellow counters to cover the wrong letters, so only the correct letter is visible. I’m hoping that helps it stick in their minds. Thank you so much for these resources! I love you how you modify these to make them work for you, Sheri. Thanks so much for sharing that idea! I am working with an adult to improve literacy. These downloadable, printable tools are a godsend. Thank you so much! 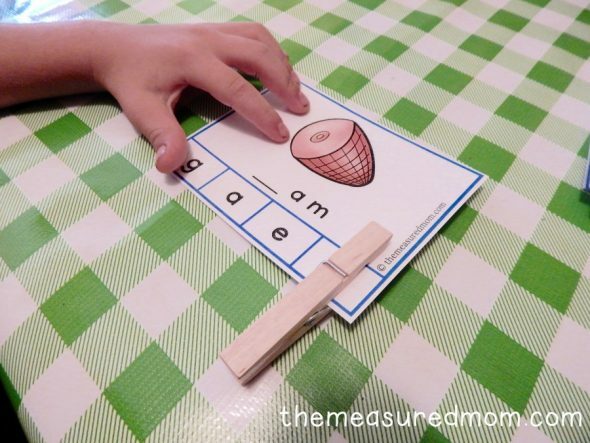 I’m wondering if laminated sets of some or all of the tools to teach the alphabet and phonemic awareness are available for purchase as opposed to me printing and laminating myself. If not, I’ll get to work right away! I’m glad you can use these, Liz! And no – I do not offer printed, ready-to-go resources (and do not expect to in the future). Thank you so much for sharing!I love use this activites.My students really enjoy them. 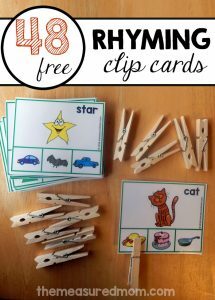 Thank you so much for sharing!I love using this activites.My students really enjoy them. It also very easy to modify them once the student has mastered the concept. I’m glad these activities are working for you, Lora! Thank you so much for the kind words, Ginamarie! Thank you SO much for this kind comment, Kari! I love your resources and am very thankful!! I printed out a set of beginning/middle/end sound clip cards awhile ago but I cannot locate them on your site or in my computer…. Can you email them to me again please?